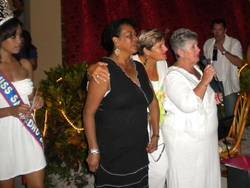 Volunteers working together to bring Mama Vilma's Family Home for the abused and neglected to a reality are ecstatic and overjoyed with the huge success of their first ever fundraiser. 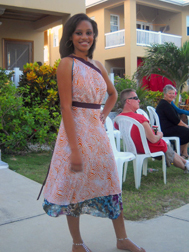 The Fashion Show held on February 19th, 2011 at the Coco Locos Bar was well attended with some 250 attendees. With a welcome by Miss San Pedro 2010-2011 Ms. Natasha Stuart, the program got to a bright start. 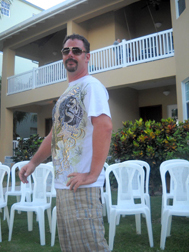 With models ranging between the ages of 15-70, males and females - there was something in the fashion show for everyone. The evening was filled with entertainment, starting with the models parading fabulous casual and swim wear fashion. This was followed by an intermission and entertainment by Lara Goldman, fire dancer extraordinaire. The second leg of the fashion show saw the models showing off their talent in elegant evening wear. Apart from the presentation of the exquisite fashion, which may all be purchased at local boutiques, the evening included the auction of a painting by Tyrell, an all day Catamaran trip onboard the Marley Jean (owned by Shelley and Dave Huber) and the silent auction of a beautiful painting by Kirt Cruz, which was a crowd's favorite. Throughout the night guests enjoyed delectable finger foods, door prizes, great music, entertaining performances and of course, fashion! The president and organizers of the Mama Vilma Fashion Show wishes to thank the following individuals: For fashion: 4:20 Men's Clothing, Island Vibes, Moon Dancer, Island Gear, Sarai's, Blu, Top Notch, D-Sea, Pretty Ethnic, Mambo Chill, Reef Boutique, Yvonne Bradley's fashions and Addy's; for food donation: Fido's, Banana Beach, Legend's Burger House, Annie's Pastry, Caye Wind, Emma Varella, Dana Palma, Atlantida Eiley, Shelly Huber and Francisca Acosta. Special thanks to: Bermuda Palms Homeowners, Coco Locos Bar, Gecko Graphics - printing, Tsunami Skydivers, Dave King - lighting, Chris Burkey - MC, Jason - DJ, Doug and Jean - Sound System; for providing chairs for the event: Pepe Molina - Pepe's Rentals, Javier Williams and Sergio Gomez of Mousepad; Joy Knutson - photography, David and Shelly Huber and Captain Chris Prevett - owners of the Marley Jean; Tyrell, Men at Work - artist, Kirt Cruz - artist, ASP Arnold and the San Pedro Police Department - Security; Carole Goudreau- hair and Makeup, Lara Goldman- Fire Dancer, Violet Henderson- Donating Mama Vilma's Family Home t-shirts that were on sale, and to Jilian - for her invaluable contribution in planning and overseeing every aspect of the fashion show. Donations and pledges to the Mama Vilma Home are encouraged and can be made by contacting Mrs. Shelly Huber at 651-3533 or 226-2447, Eve Dirnback at 623-9962, Cheryl Bowen at 625-5366, or through deposit into the Mama Vilma bank account at the Belize Bank, account # 670-1-1-28932. Every little bit helps and your contribution continues to go to a very worthy cause.